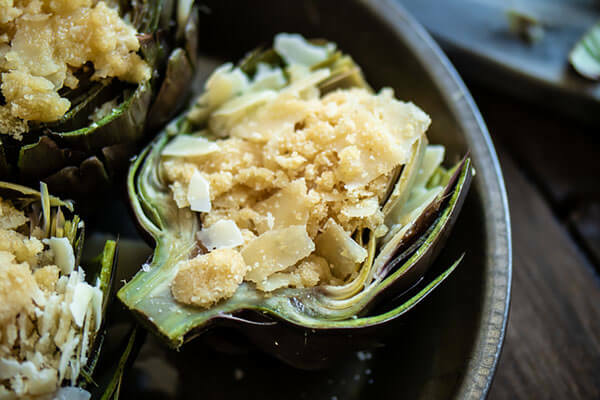 Artichokes can be one of the more intimidating vegetables to prepare but when done properly they can be a deliciously impressive side dish or appetizer! This recipe stuffs the fibrous veggie with a cheesy “breading” of almond flour and parmesan cheese and is baked to golden perfection. 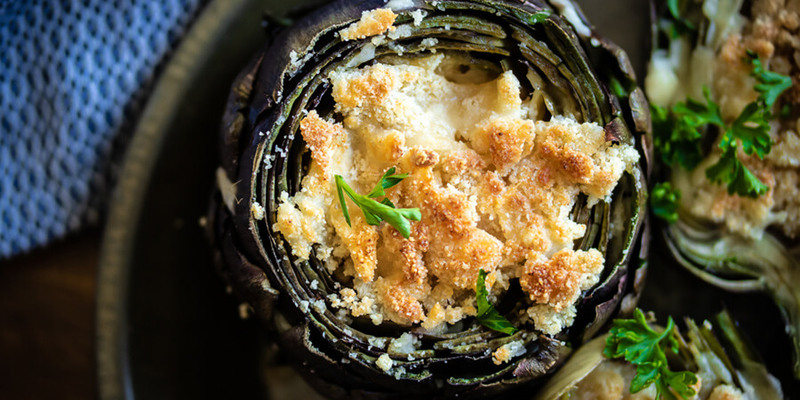 The leaves are drizzled in olive oil and are perfect for scooping the parmesan filling! Cooking a fresh artichoke is not the only intimidating part for most people. Understanding how to eat this spiny vegetable can be just as confusing! The rough leaves have an edible underside that once cooked, can be scraped with the teeth removing the meaty portion. The rest of the leaf would be discarded. The leaves are traditionally dipped in butter or sauce and scraped, though in this recipe we are scooping the bread-like filling. 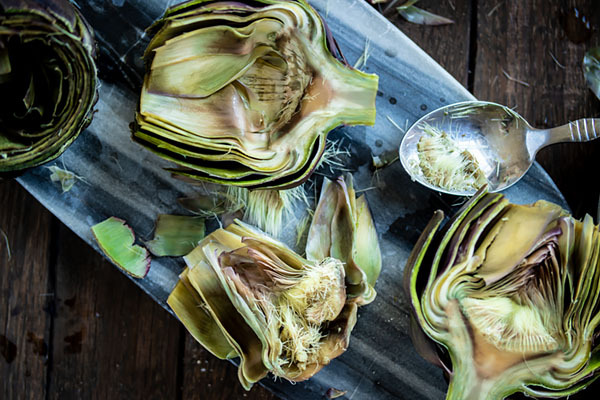 The heart of the artichoke is also edible and can be reached after removing all of the outer leaves. 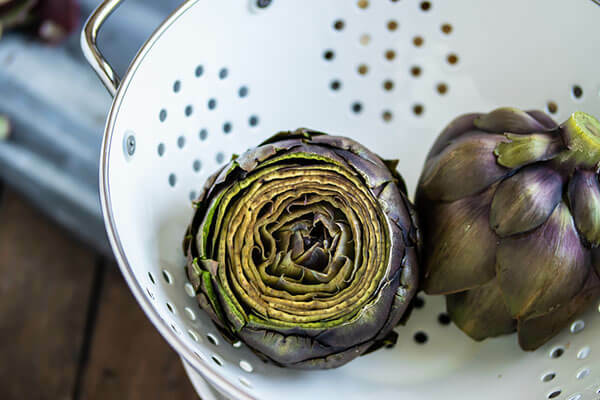 When preparing the artichokes, remember that it’s important to remove the purple leaves from the center to reveal the tough fibers or “choke”. 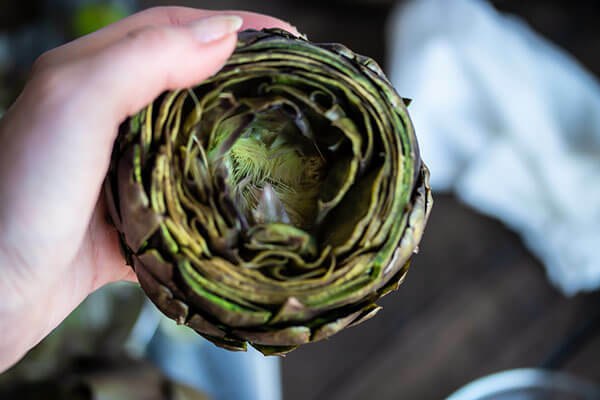 Slicing the artichoke in half can make it easier to remove, but you may also leave them whole and gently pull the leaves apart to reveal the center flower and choke. 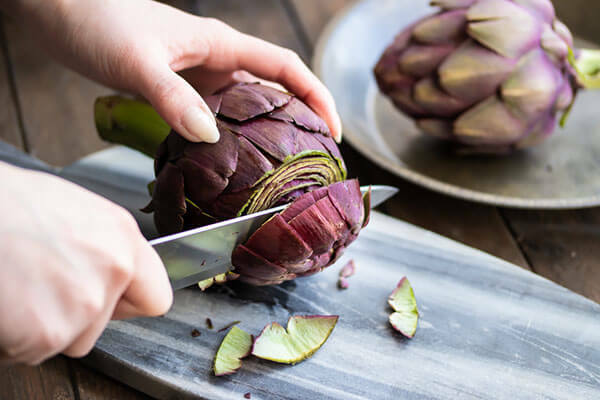 A sharp knife goes a long way with preparing a raw artichoke, but once they have been steamed or boiled they are much easier to work with! 1. Set up a large pot with water to boil. Also, preheat your oven to 350 degrees. Coat a baking sheet with non-stick spray. Set aside. 2. Rinse artichokes well. 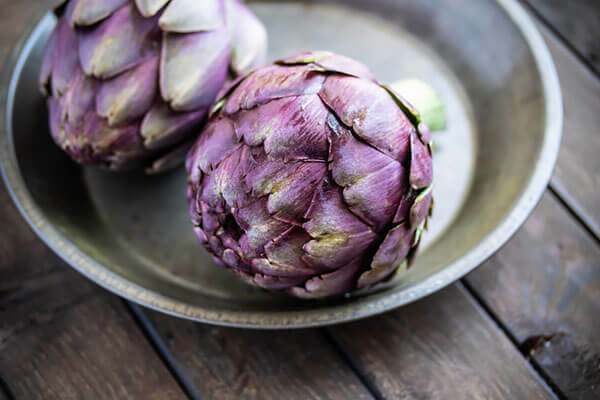 Using a sharp knife, cut off the top of the artichoke to expose the purple center, and trim the point from the outer leaves. Cut the stem so the artichoke can sit on a flat surface. 3. Bring the water to boil and ensure the water will cover the artichokes. Place each artichoke in the water and cover. Reduce the heat to medium and simmer for 10-15 minutes. 4. Remove the artichokes from the hot water and drain upside down to dry and cool. 6. Slice each in half and remove the entire choke with a sharp spoon or small knife. 7. 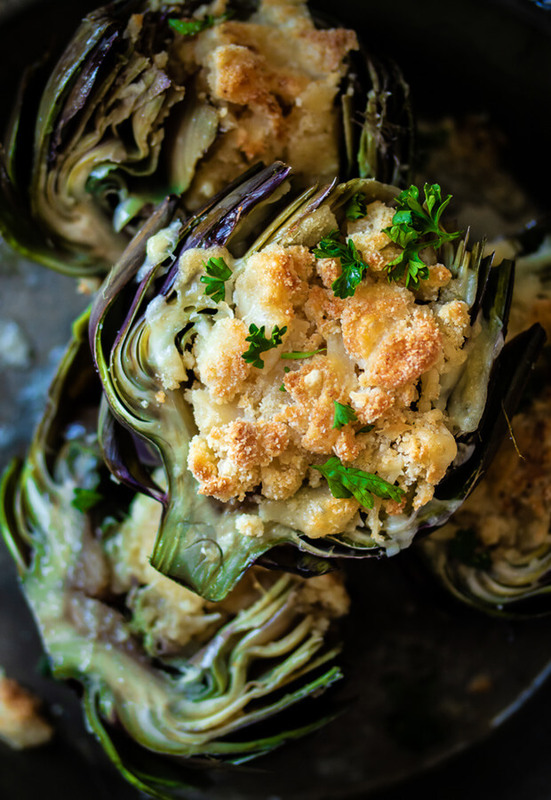 In a mixing bowl, combine the almond flour, mayonnaise, garlic, and parmesan cheese to create artichoke filling. 8. 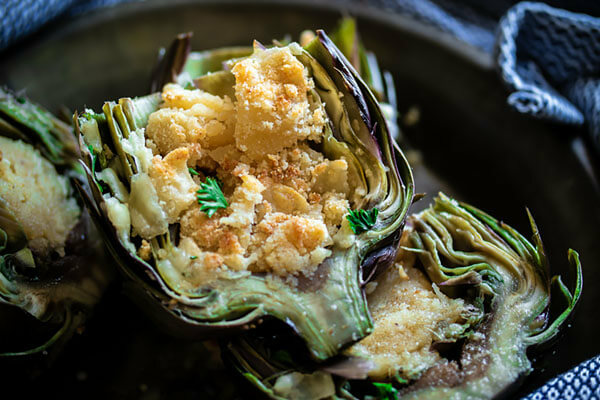 Drizzle each artichoke half with olive oil. Stuff the center of the artichoke halves with the prepared filling. Make sure you put some filling in between the leaves, too. 9. Place artichoke halves on the baking sheet. Space evenly. 10. Bake for 15 minutes or until the filling turns a golden brown. This makes a total of 4 servings of Keto Stuffed Artichokes. Each serving comes out to be 307.58 Calories, 27.7g Fat, 6.33g Net Carbs, and 6.63g Protein. Set up a large pot with water to boil. Also, pre-heat your oven to 350 degrees. Coat a baking sheet with non-stick spray. Set aside. Rinse artichokes well. Using a sharp knife, cut off the top of the artichoke to expose the purple center, and trim the point from the outer leaves. Cut the stem so the artichoke can sit on a flat surface. Bring the water to boil and ensure the water will cover the artichokes. Place each artichoke in the water and cover. Reduce the heat to medium and simmer for 10-15 minutes. Remove the artichokes from the hot water and drain upside down to dry and cool. 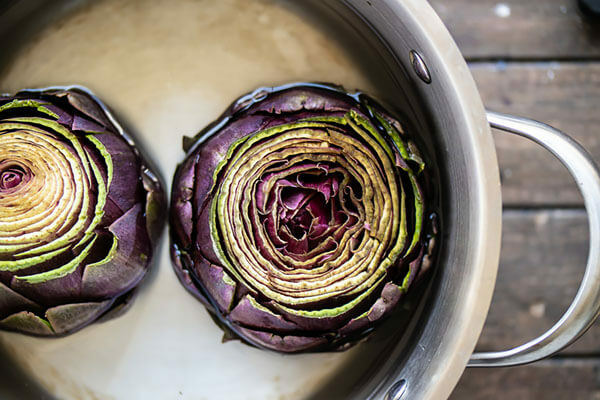 Pull the purple leaves from the center of the artichoke to reveal the tough fibers or “choke”. Slice each in half and remove the entire choke with a sharp spoon or small knife. 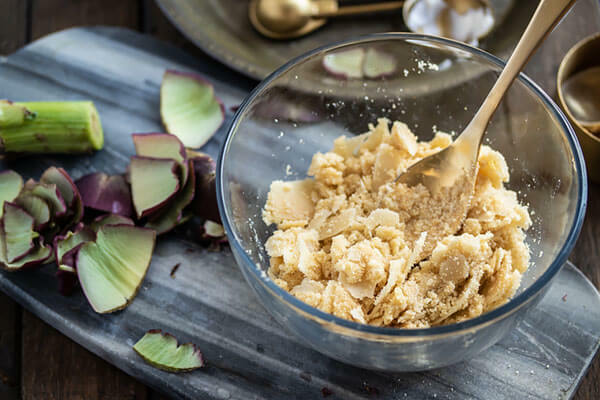 In a mixing bowl, combine the almond flour, mayonnaise, garlic, and parmesan cheese to create artichoke filling. 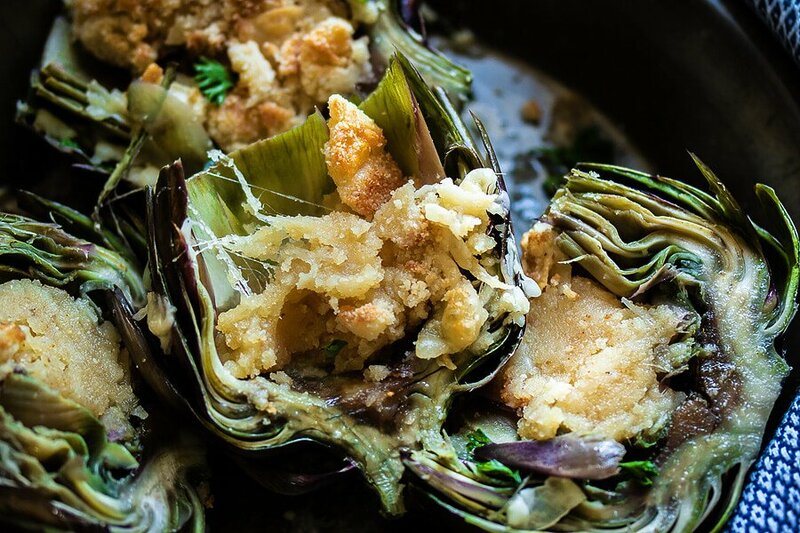 Drizzle each artichoke half with olive oil. Stuff the center of the artichoke halves with the prepared filling. Make sure you put some filling in between the leaves, too. Place artichoke halves on the baking sheet. Space evenly. Bake for 15 minutes or until the filling turns a golden brown.